Report: U.S. CLEAN Programs – Where Are We Now? What Have We Learned? 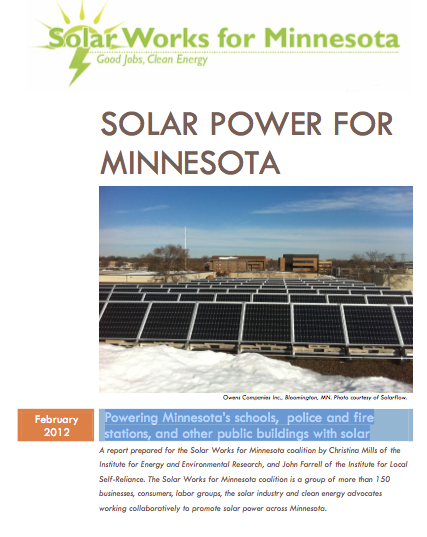 This report from the Institute for Local Self-Reliance identifies all of the existing CLEAN (Clean Local Energy Accessible Now) programs in the United States (also known as feed-in tariffs) and examines the lessons learned from the early adopters. CLEAN programs (Clean Local Energy Accessible Now) provide long-term contracts with utility companies whose price is set to guarantee a modest return for investors. They have long been used in Europe (as “feed-in tariffs”) to spur renewable energy development, often with remarkable success. In Germany for example, CLEAN contracts have been credited with developing over 50,000 megawatts of wind and solar power. Indeed, so successful have these contracts been that Germany recently all but eliminated the premium paid for solar energy and re-directed the premium to encourage innovation in on-site use and storage systems. While late to the game, Americans are finally in the game. In 2012, all or part of fourteen American states have adopted CLEAN contracts for renewable energy. Many more are in development. The recent surge in popularity coincides with the recognition that on-again, off-again federal tax incentives undermine renewable energy investments and that the falling price of solar energy creates a need for a more flexible and regionally tailored transitional incentive. But U.S. CLEAN programs still suffer from four common shortcomings. Program Caps: A key shortcoming of U.S. programs is very small program size, especially given that these are multi-year, cumulative caps. Evidence from other countries is that larger scale programs achieve greater cost reductions. Scant Support for Small Scale: Another shortcoming, as discussed in greater detail in the full report, is the lack of support for on-site residential solar. Sacramento, for example, allocated almost all of its 100 megawatt (MW) allocation to projects 1 MW and larger. Palo Alto’s program is restricted to projects 100 kilowatts (kW) and larger. Although there may be some cost savings involved in focusing on larger projects, these are modest. On the other hand, the benefits of having tens of thousands of households with on-site solar and therefore an economic self-interest in supporting expanded renewable energy far outweigh the possible increased costs. Europe has found this to be the case. Nearly 90% of Danish wind turbines are locally owned, as is most of German solar and half its wind power. Financial Complexity: Another shortcoming of U.S. CLEAN programs derives from federal renewable energy policy. Unlike Germany, the U.S. uses tax incentives. The search by CLEAN program participants for tax equity partners increases the complexity and the cost of renewable energy programs. It also dramatically restricts the potential for non-profit organizations and the public sector, which are tax exempt, to host renewable energy generators. The ideal CLEAN program has an all-in price that allows investors to earn a return without having to resort to creating complex tax equity arrangements. This allows CLEAN regulators greater flexibility in tailoring the program to specific objectives and in modifying the program quickly as the external context changes (e.g. cost reductions in renewable energy). CLEAN contracts also allow for the promotion of small-scale and locally owned generators. All U.S. states and utilities price their CLEAN contracts assuming the use of tax incentives. This saves local ratepayers money but costs the programs flexibility and subjects them to the vagaries of political changes in Washington. Minimal Planning: Few U.S. CLEAN programs have transparent and predictable price adjustments (like the German “growth corridor”) or incentives for on-site consumption and storage to encourage more effective use of distributed renewable energy. The following table summarizes the state of CLEAN programs in the U.S. Program prices assume the use of tax incentives by participants. Without that assumption, the prices would have to be much higher. 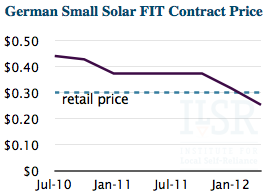 Prices have been normalized for solar insolation, contract length, and currency. Prices in bold are for programs supporting residential solar, and otherwise reflect the price for the smallest solar supported under the program. In comparison, the German feed-in tariff (FIT) is an all-in price that doesn’t require the use of extraordinary tax incentives for investors to earn a return. Yet the German FIT is lower than all comparable U.S. CLEAN programs. That is a testament to the length, dynamism and success of the German program. 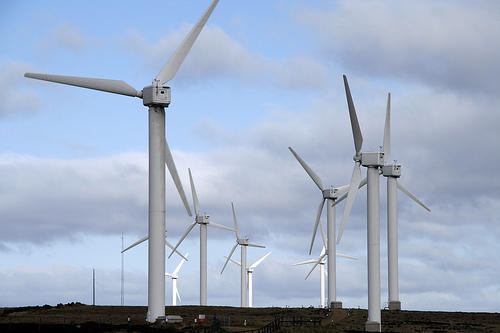 As the renewable energy industry has increased, its price has decreased. 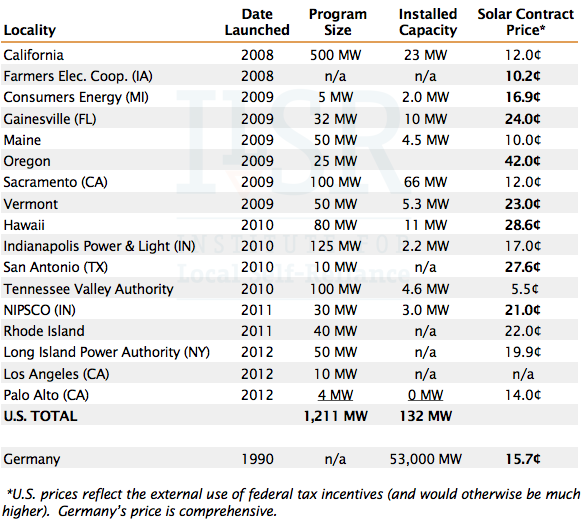 As the chart shows, the German FIT was set at 45 cents per kilowatt-hour (kWh) in 2010 (down from 75 cents in 2004) and in its recent iteration has a price set at 25 cents per kWh (not adjusted to U.S. insolation as in the table). 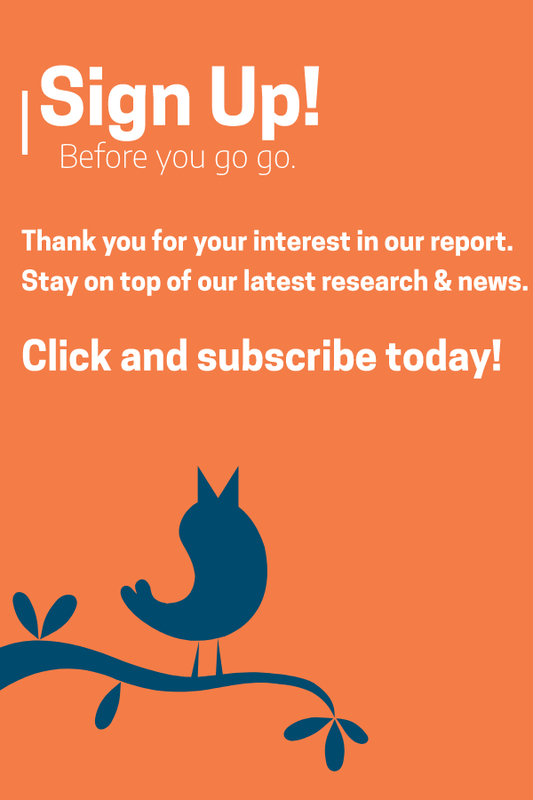 Get email updates on our energy work!